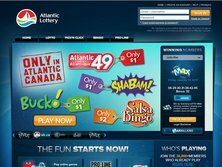 The Atlantic Lottery Corporation (ALC) has been in the gaming industry since 1976. The company runs under the license provided by New Brunswick. This is so popular since the company is well advertised across the social media, radio broadcast, billboards, and television networks. The website is also commendable for being user-friendly and for displaying the winning numbers and draw dates. Aside from being a gaming site, the company also ensures that it can give back to the community. Profits of the company directly go to the social community works for the benefit of the people in need. The company practices its social corporate responsibility for the Atlantic Canadians. This enables the ALC players to extend their help to the public while enjoying their games at the same time. Spielo G2 provides the software for the Atlantic Lottery. Slots, blackjack, and poker are missing in this site. To experience the said gambling games, it is recommended for you to look for another site. 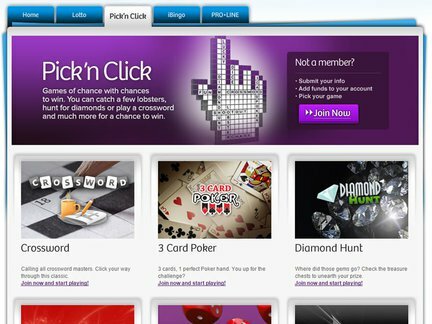 ALC does not deliver an online casino but its collection of lotto, pick 'n click, bingo, sports betting, and online gaming are quite impressive. For the lotto lovers, there is the Lotto Max where you can ace a jackpot prize ranging from $ 10 million up to $ 50 million. Another $ 1 million prize can be all yours when you try to join Lotto 6/49 accessible during Wednesdays and Saturdays. If you are not that confident to grab these huge rewards, maybe you can give Atlantic 49 and ShaBam a try. These two lets you win $ 20 up to $ 15,000. Crossword, Diamond Hunt, Lobster Chase, Lucky Dice, and Shoot Out are just some of the pick 'n click games that can also give you fun time. Multiplayer bingo games such as East Coasters, Kitchen Party, Oceanside, and Atlantic bingos are also in hand to allow you to interact with other gamers. If you prefer to be on your own flight, Wave and Lighthouse bingos are the single player games for you. Of course, sports gamblers should also have fun. Pro-line enables the players to place their bets on basketball, baseball, football, hockey, and other sports. The payout rate of the gaming site is noticeably high. A day comprises of over 90,000 mixes of huge and little wins. Players can instantly play the site's available games through a web browser. If you have to be on the road, you can still indulge in the games wherever you are because of the mobile version available. The site allows players to bring their games like bingo on the go. The company supports iOS and Android platforms. Through your iPhone, iPad, or Android devices, you can also download Atlantic Lottery game such as Washer Toss which is at display in app stores. Currently, ALC bonus is not offered. Promos like welcome and sign up bonus, referral incentive, no deposit credit, loyalty clubs, and other packages are regrettably unavailable. To ace such offerings, it would be much better for a player to try other international online gaming site. Let's not lose hope and just wish for Atlantic Lottery to give out these gaming incentives in the near future. Money transactions can be made through credit cards like Visa or MasterCard. The list of allowed banking options is sent to you once you register your account. ALC is caters and serves the people of Labrador, New Brunswick, Newfoundland, Nova Scotia, and Prince Edward Island. However, the site is not available in other neighboring provinces. So if you prefer a site that accepts all Canadian players, you better pick a top rated international company. The site can be configured to use the English or French languages. Before reaching out to a customer support representative, Atlantic Lottery provides a help page containing the frequently asked questions and their corresponding answers. Clients should check first this comprehensive help page and try to troubleshoot their issues on their own. If you are still having a hard time resolving your issue, you better contact the support team via email address or phone number. Contact numbers are as follow: 1-800-461-1234 for New Brunswick, 1-888-899-HELP (4357) for Newfoundland and Labrador, 1-888-347-8888 for Nova Scotia, and 1-855-255-4255 for Prince Edward Island. Some of the complaints against the company are their rude staff and fake email notifications stating that the customer won a certain amount. One customer said that he received a letter from Atlantic Lottery to let him know that he won $ 4955. The letter was accompanied with a check but later he realized that it was a just a scam. In fact, there are many customers who are complaining the same issue. Therefore, it would be fair to say that the company's rating is 2 out of 5.